Rather than a having a low-pressure mass surrounded by swirling air, an anticyclone is an air mass centered around a high-pressure area with air rotating around it in a clockwise manner (in the Northern Hemisphere) and counterclockwise south of the equator. As with a cyclone, in an anticyclone air rotates faster the greater the difference between the air pressure at the center compared to the surrounding air. 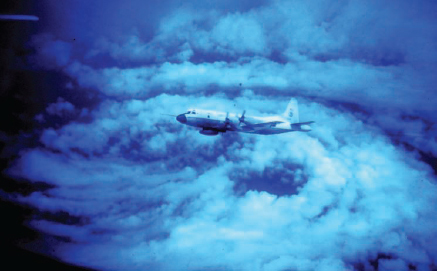 A P-3 airplane operated by NOAA flies near the eye of a hurricane (NOAA).